Several shirt options this year - we have a few camo left from 2015! 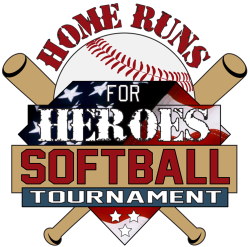 Purchase up to FOUR extra home runs per game for the whole tournament by obtaining home run bands. We'll write your team name inside and you'll show it to the ump to increase the team limit. We’ll be raffling off THREE Slow Pitch Softball Bats this year! Come see them at the Registration Table or check in with our Volunteers during the tournament. Drawing will take place at after the tournament and we’ll alert the winners by phone. Get Home Runs for Heroes gear to keep your drinks cold or hot!